Last week I took my kindergarten classes to Sweden! Okay, we didn't actually leave the school. Instead we discuss Slöjd, looked at crafts from Swedish children, and worked with our hands to build our own crafts. By providing my students with the resources to explore Swedish culture, they left the classroom feeling as if they had traversed the globe. During my recent visit to the Nordiska Museet I was really inspired by the Skol Slöjd exhibit, an entire exhibition dedicated to the importance of school craft. 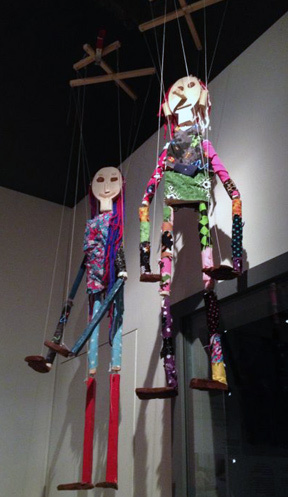 Among the many beautiful crafts were these large marionette puppets that had been carved from wood and covered in beautiful textiles. I reached out to the museum to see if there were any additional resources that they could share with me from this exhibit. One of the museum curators responded with photos, text, and even an introduction to the educator who lead the students that made those beautiful puppets I saw at the museum. I gathered all of the information and began writing curriculum. I focused on two things: providing my students with a chance to experience Swedish culture, and teaching them practical art making techniques. The class began with a quick look at a world map and an invitation to come with me on "an adventure!" (A bit of pandering on my part - what kindergartener doesn't want to go on an adventure?!) I showed them the images of Swedish children working with wood and textiles to build their puppets. We took a minute to do a creative movement exercise exploring the proportions of our own bodies (Head, Shoulders, Knees, and Toes is a great way to do this with kindergarteners). Then I introduced them to their materials - wood (craft sticks) and textiles (scraps of old clothes). I was very impressed with the way my students were focused on this project. Each student took their time adding intricacies to make their puppet a representation of themselves. Afterwards I noticed some students using their puppets to communicate with one another. The arts open up opportunities to introduce your students to vastly different cultures, and research shows that those schools who are incorporating global curriculum into their classrooms are seeing some great improvements. If anyone is interested in using any of my resources on Slöjd please contact me. I'd be happy to share them.